WA has one of the few remaining sustainable abalone fisheries in the world. 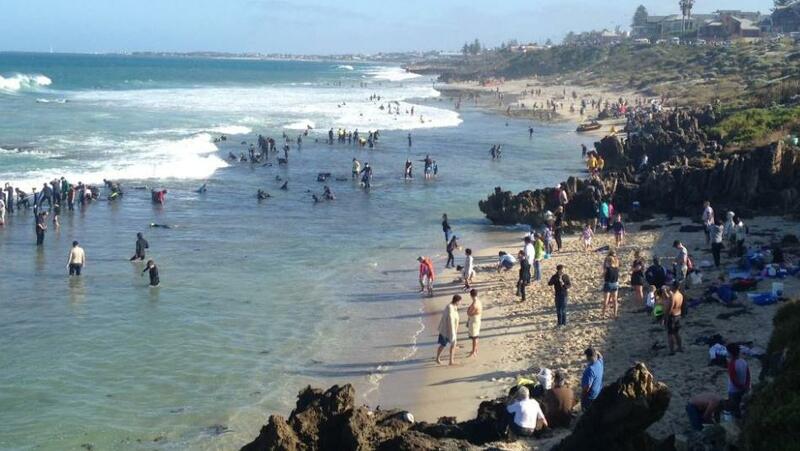 Want to catch abalone in Western Australia? Here’s what you need to know. Abalone are highly prized for their unique taste and in Western Australia, we are spoiled for choice with three different types of species that can be found here along our long 12,889km pristine (and varied) coastline. 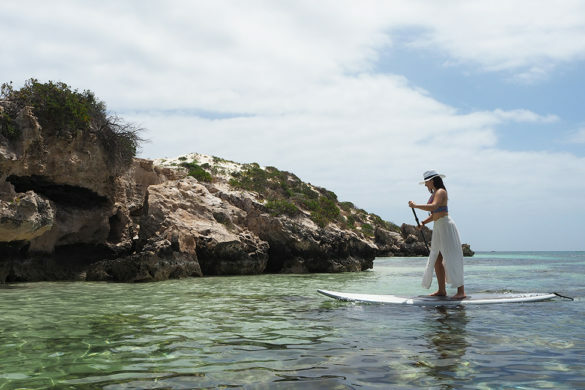 With such large coastal spread, pretty reefs and lots of colorful, curious fish to watch what you’re doing, abalone fishing in Western Australia is a challenging but rewarding activity for you to enjoy with friends and family. 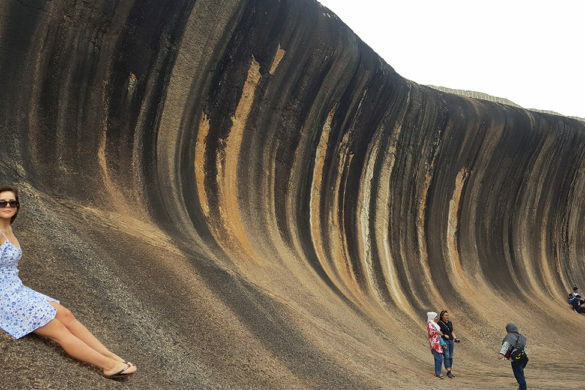 With such a brief window of opportunity, fishermen and enthusiast flock to WA waters regardless of weather conditions, and this is what makes abalone fishing such a risky, dangerous activity, with many lives lost due to slippery rocky reefs and bad weather conditions. 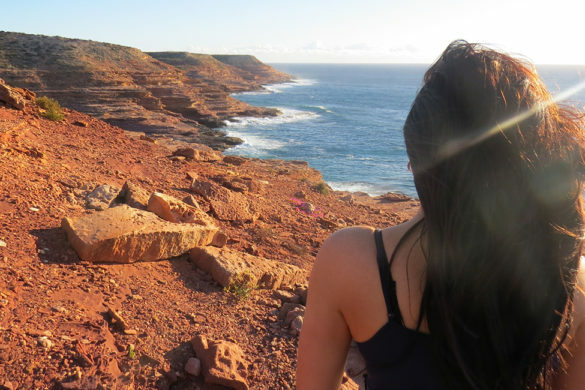 To protect both the abalone species from being over-fished, as well as human safety, there are strict rules and regulations in place that make Western Australia one of the few remaining sustainable abalone fisheries in the world. 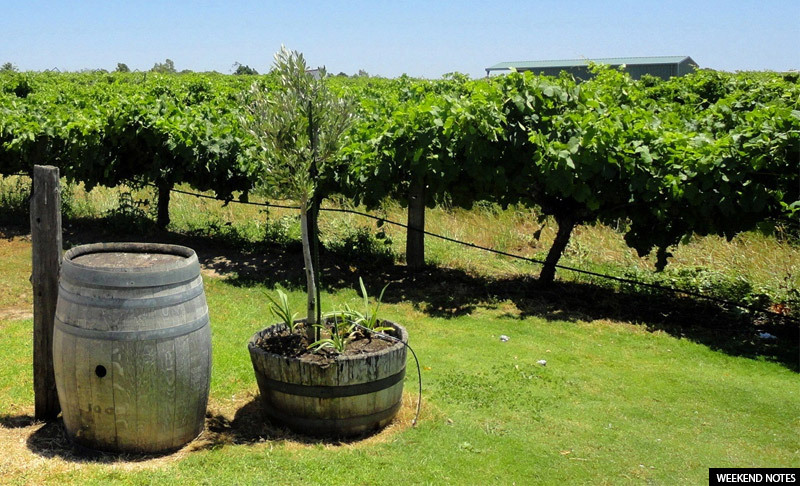 There are three types of abalone in Western Australia. The most common are roe (which inhabit reef platforms mainly across the south west, north to about Steep Point) followed by greenlip (which are considerably larger than roe and identifiable by their pale, shiny green appearance) and the largest of the lot, brownlip. Both greenlip and brownlip mainly live off the state’s southern coastline preferring limestone or granite seabeds in waters deeper than 5 metres. The great thing about living in Perth, however, is that you don’t have to travel far to find some more abalone. 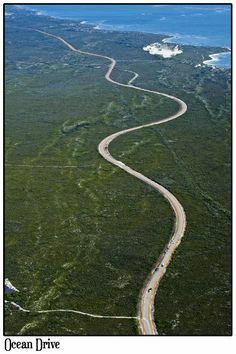 For example, Burns Beach and Mettams Pool off the Tourist Coastal Road (both North of the River) are fantastic local spots for abalone sighting. 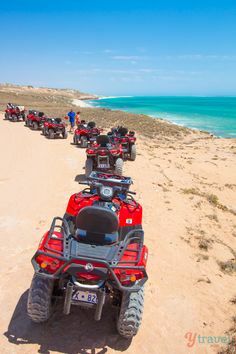 Otherwise, if you don’t mind heading on a mini road trip (and you count yourself as a ‘advanced’ in the water) then head to the South West where rocky beaches are full of abalone but conditions are generally rough. 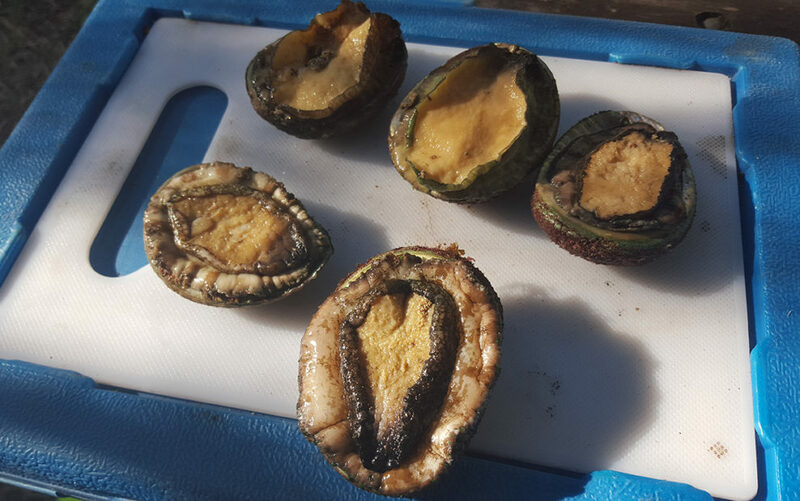 If you are going abalone fishing in the South West, be mindful there are different sections of coast where abalone fishing is prohibited. Check online for details. Here I am frolicking in a shallow, rocky area where abalone were present. I almost got wiped out by whitewash in this area, so be careful of conditions. 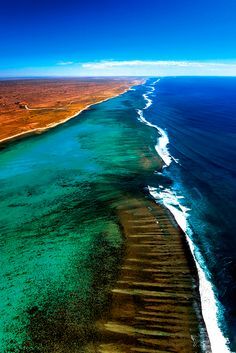 This is in the South West of Western Australia. Abalone are marine snails that are not your ordinary boring snails. They are very famous for their taste, and have been considered to be a desirable delicacy by cultures worldwide for centuries. Abalone can be consumed raw or cooked, and while the meat (foot muscle) is used for food, the beautiful coloured exterior shells (which are composed of nacre – Mother of Pearl) are often used as decorative items for buttons, buckles, inlay and jewellery. 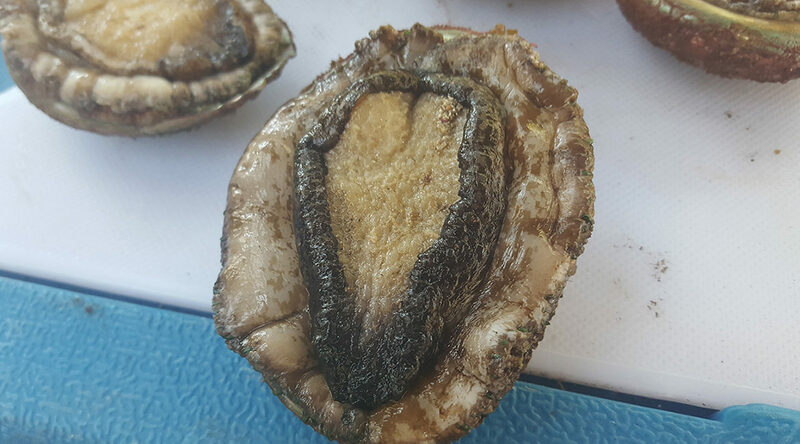 The meat of the abalone mollusc is considered a delicacy in certain parts of Latin America (especially Chile), France, New Zealand, Southeast Asia, and East Asia (especially in China, Vietnam, Japan and Korea). In the same way as shark fin soup or bird’s nest soup, abalone is considered a luxury item, and is traditionally reserved for special occasions such as weddings. And did you know? Abalone shells have been found in archaeological sites around the world, ranging from 75,000 year old deposits at Blombos Cave in South Africa to historic Chinese abalone middens on California’s Northern Channel Islands, which were harvested by Native Americans for at least 12,000 years. In addition, the shells were also used as currency for many ancient tribes. Fast forward to today, and these shells are still distinct in shape with their low, open spiral structure and their beautiful Mother of Pearl colours. 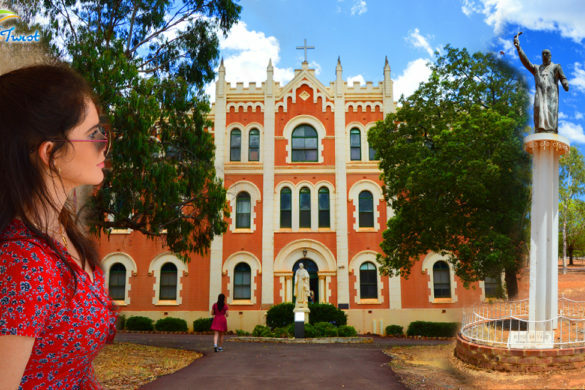 Yep, you could almost say that abalone has had a human “cult following” for centuries. But for any living species on Earth, being so popular with humans isn’t exactly ideal for species survival. Unfortunately, widespread popularity for abalone over thousands of years has seen many of the species become extinct, and indeed, over-fished to point of being critically endangered. Do these abalone remind you of anything? Anything at all? Don’t blush! But look at that delicious, tender meat waiting to be enjoyed. 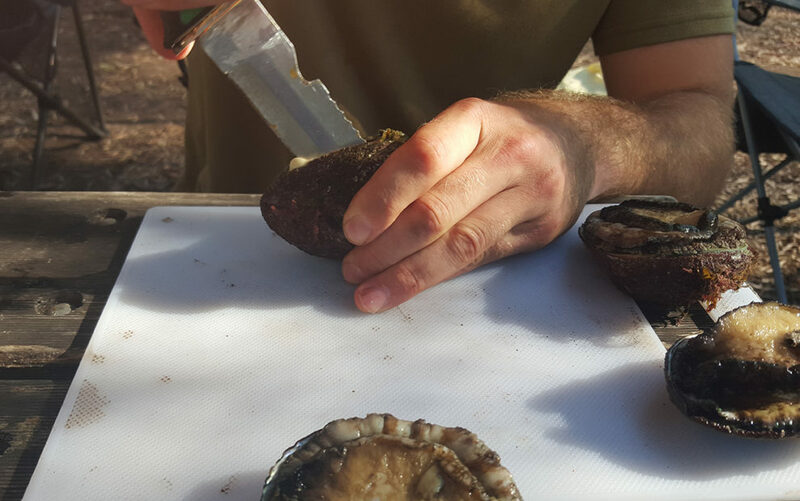 Abalone fishing is taken very seriously in Western Australia, and with around 20,000 recreational licenses issued each year, there are many rules and regulations in place to ensure long term sustainability of abalone breeding as well as for public health and safety. 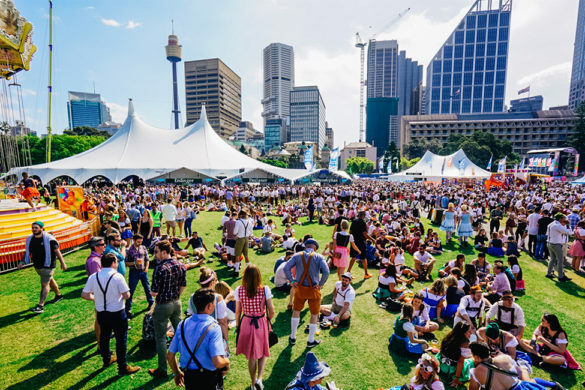 The WA commercial fishery (which is valued at about $10 million per year) manages everything through quotas that are set each year to ensure the fishery’s long-term sustainability. The recreational catch is managed through size and bag limits for example, as well as closed areas and seasons. 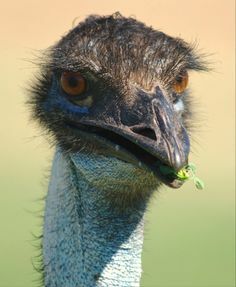 This is my friend, Chris. 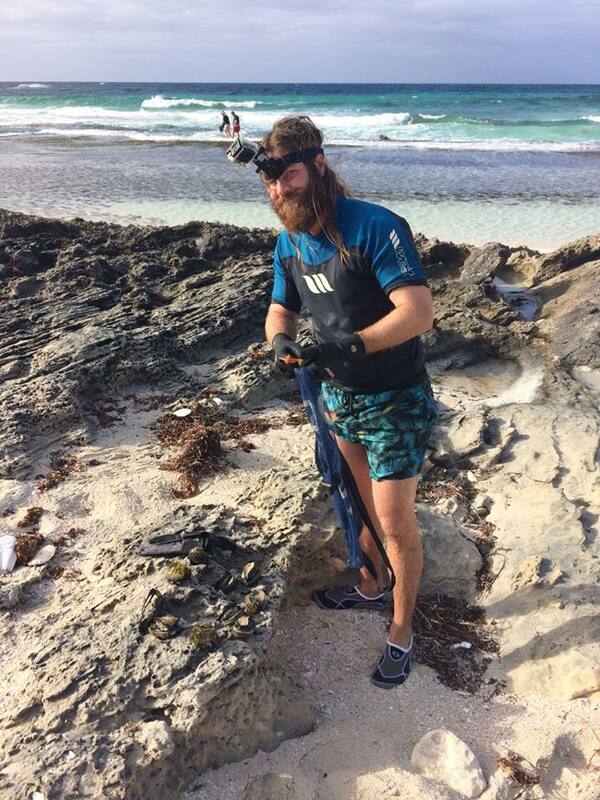 He works on Rottnest Island, is an advanced abalone fisherman, and a massive Star Wars fan (like me!). So you decide you want to catch abalone? Assuming you already got your license online here and your equipment, the main things to remember is to respect others around you and to respect the environment. Health and safety goes above everything else, so make sure to respect the space of others around you. The dive knife needs to be flat at the tip so the blade won’t break when trying to pry it between abalone and reef. A sturdy stainless steel knife is optimum so it won’t rust while keeping the function of a dive knife to cut. 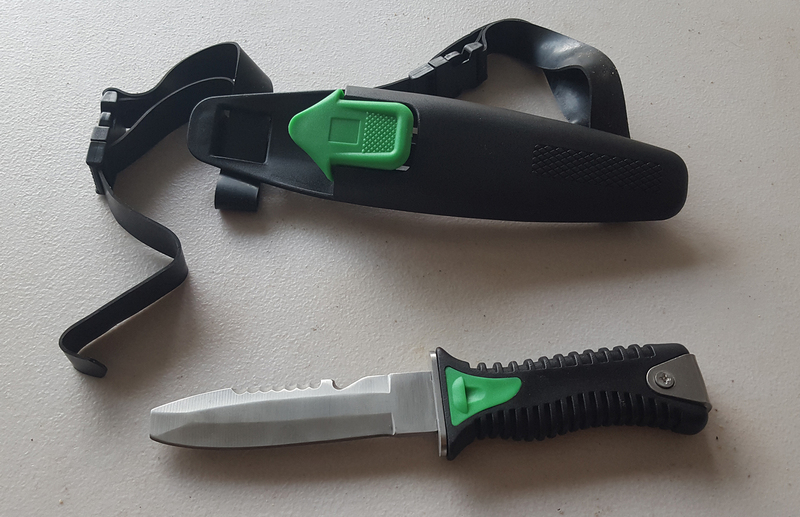 (Alternatively, if you don’t have a dive knife or feel comfortable with a knife, you can use a flathead screwdriver instead). Dive Booties are essential if walking on a reef, as the reef can be very sharp and you can really shred your feet up – and ouch – that would hurt! And don’t forget your measuring gauge and catch bag – as both are legally required! There are a few different ways of catching abalone, the popular being standing up, snorkel, wadling or diving. Standing up is where the abalone’s environment has flat reefs at low tide, and diving is required when its deeper water (meaning higher tide) to access the reefs. Diving is suited to advanced abalone fisherman who also have a certified diving license. 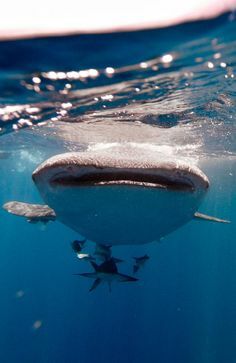 Snorkel is also very common, and like diving, it’s used when higher tide is in to access underwater reefs near the shoreline. When you see abalone, the proper practice of catching them is to measure it before you take it off the rock, because taking abalone off the rock can seriously damage them and they can die as a result. This is why its encouraged to have a measuring gauge on you, so you can measure them before you pry them off. And in case you’re not familiar with what a measuring gauge is, it’s a ruler type tool that measures the width your abalone. 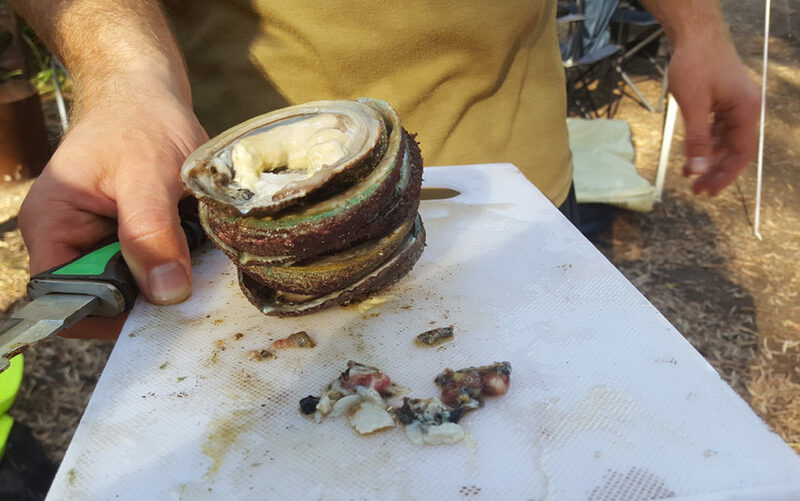 The general rule of thumb is, if the abalone touches the gauge at both ends, it’s well sized and meets the requirements, and if it doesn’t touch at both ends, its too small and must be left behind. The knife Chris uses. Reliable! If you are unsure about what rules cater to your license, or you need further clarification, visit www.fish.wa.gov.au/Abalone-Recreational-Fishing for all-you-need-to-know information. Remember, the penalties are severe if you do not follow abalone fishing rules, and the fines you would have to pay are in the thousands. 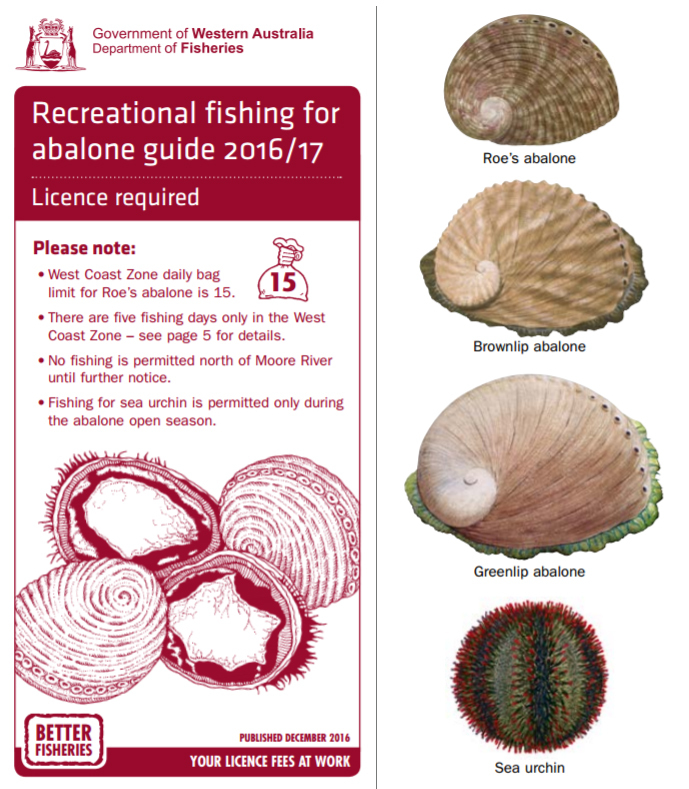 Download the Recreational Fishing for Abalone Guide 206/2017 here. 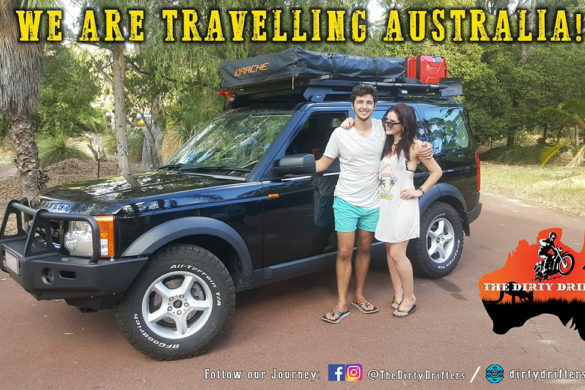 Chris loves abalone fishing and often takes his girlfriend and parents (who also have licenses) to his favourite spots in the South West and on Rottnest Island, making it a great family activity for all to enjoy. Catching abalone can be a fun family and friends outing. Just make sure the amount of abalone you catch is in accordance with limits per license holder. Abalone fishing can be a competitive activity where many aim to get abalone in the same spots. 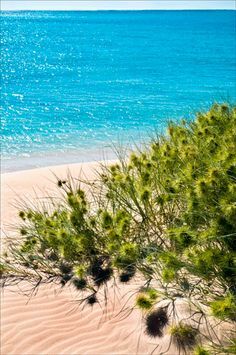 This can be dangerous, because the swells can knock people around the reefs which can easily make a person loose control or be swept off. Be mindful of others around you and be respectful of space – because one slip while holding a knife can seriously hurt someone. 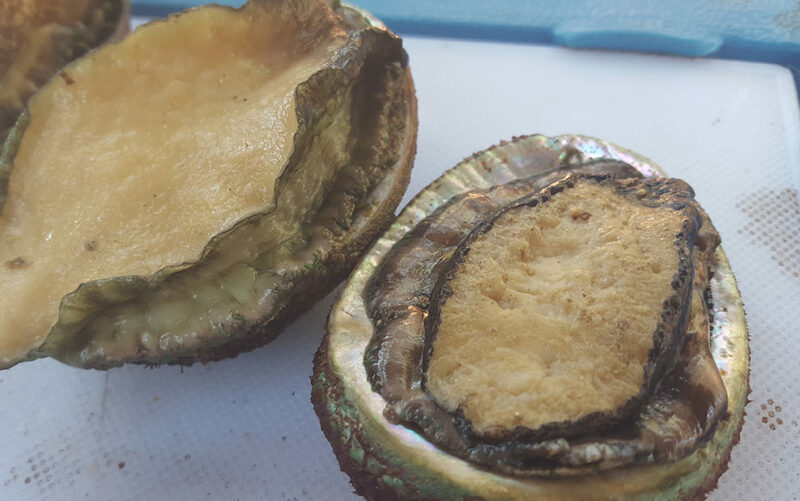 As rare as a delicacy as abalone is, and as fun as it is to catch, be mindful of the conditions as abalone fishing can be extremely dangerous and lives have been lost. If the weather and conditions are unsafe, or looking unpredictable, give it a miss. As good as they are, it’s not worth your life. 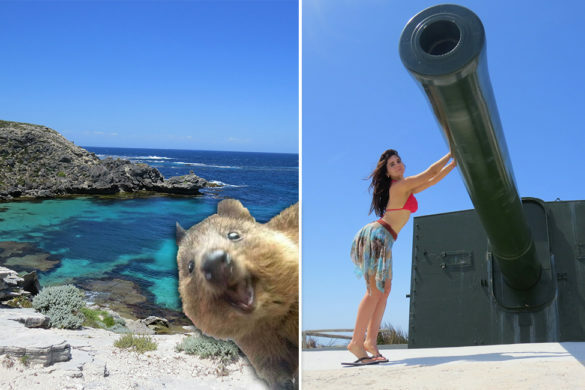 Please be safe, have the proper equipment and never abalone fish alone – always go with a mate! Check out some GoPro footage attached to Chris’s helmet of his recent Abalone Fishing trip! (Please note that visually these abalone were easily identifiable as being well over the minimum size limit). Camping? 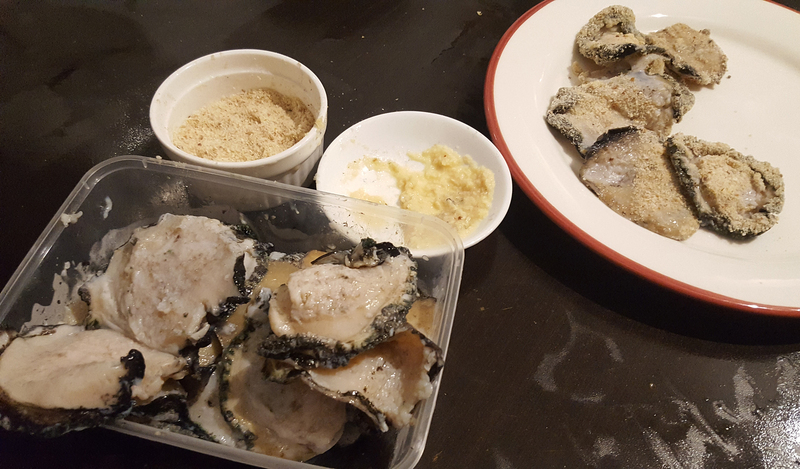 Here’s How to Cook Your Freshly Caught Abalone. 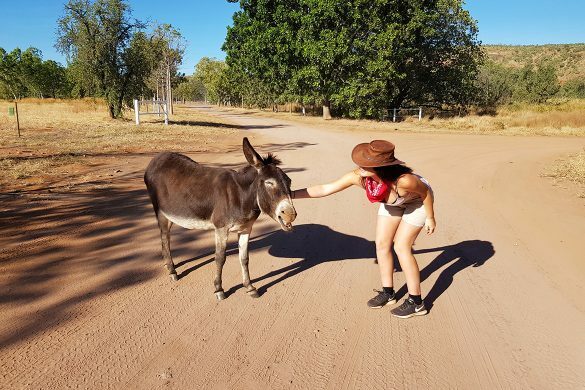 Western Australia has some beautiful camping spots. 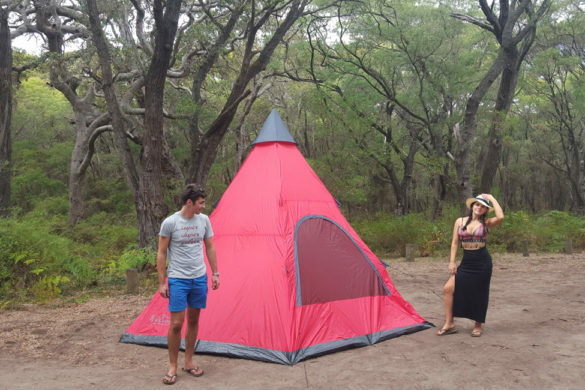 At the start of the year, I went camping with Chris and a group of other friends at Contos Campsite in the South West. 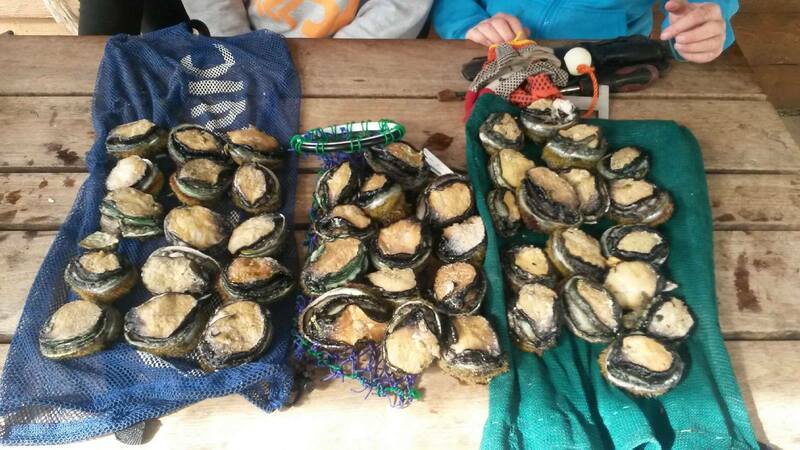 Chris and I (being the only two with abalone licenses) got some abalone for the others. Cut down the flat side of the abalone. Be careful of fingers! Abalone are slippery. Step 1. 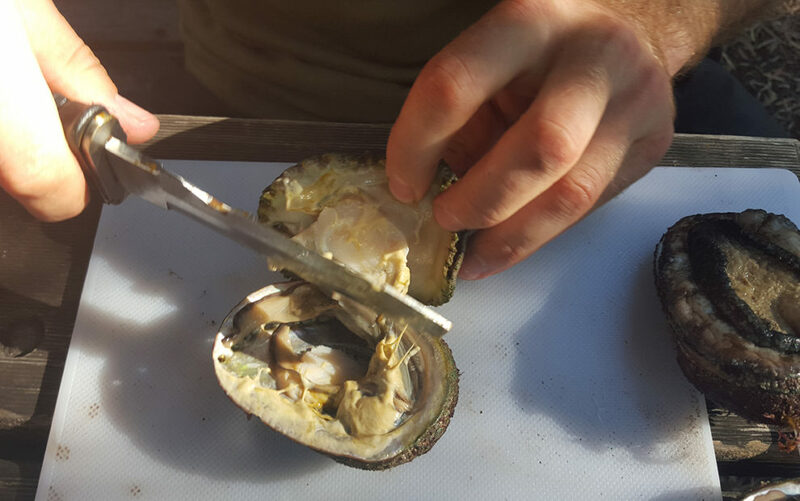 Cut down the flat side of the abalone as it’s easier to get the knife in to cut their joining tendon. Be careful as abalone is slippery. 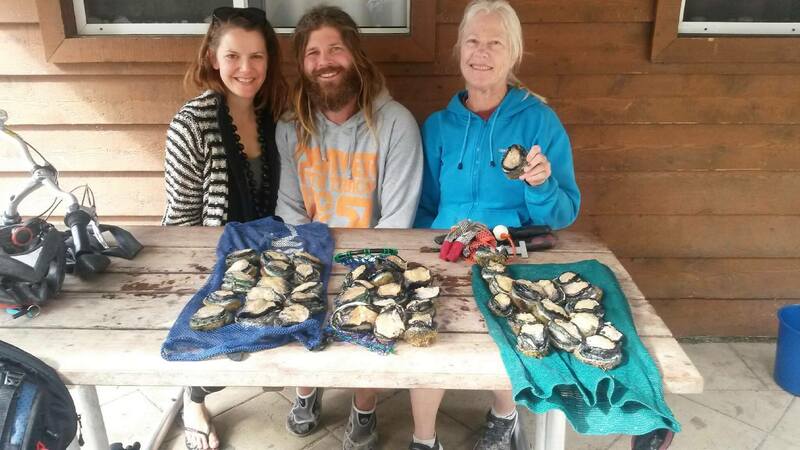 Every little bit counts – don’t waste any abalone! Step 2. Be sure to put in the extra effort to cut out the small bit of meat after the main body is out. Step 3. Discard of the scraps appropriately otherwise it will smell and you may attract possums out in the bush! Cut them in half so they are easier to tenderise. Step 4. Cut them in half so they are easier to tenderise (and it also shares around better as you get more pieces if you’re feeding a small group of people). Have a pot of water nearby to wash them off, to wash any sand and grit off. 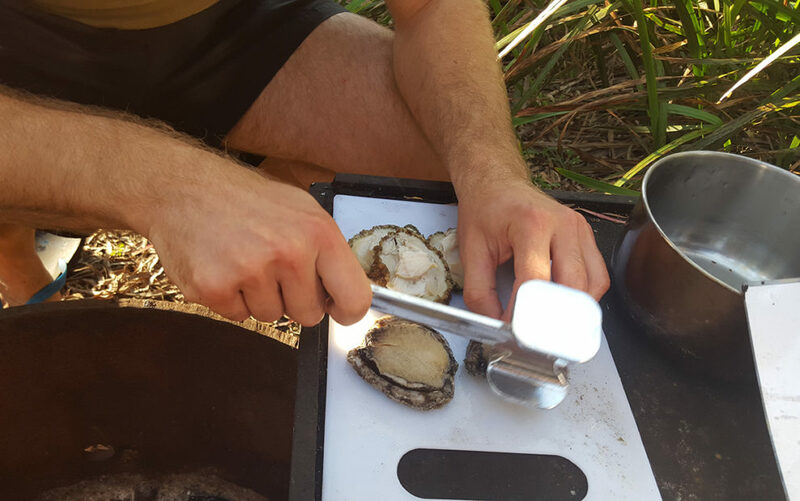 Use a ‘meat tenderiser’ to pound the abalone meat before cooking. Step 5. Use a ‘meat tenderiser’ to pound the abalone meat before cooking. Doing this will make the meat more tender and extra delicious. Make sure when doing this, you’re wearing clothes you don’t mind getting sprayed with abalone juice! As it gets everywhere and dries on you like glue! Preparation for flavouring the abalone. 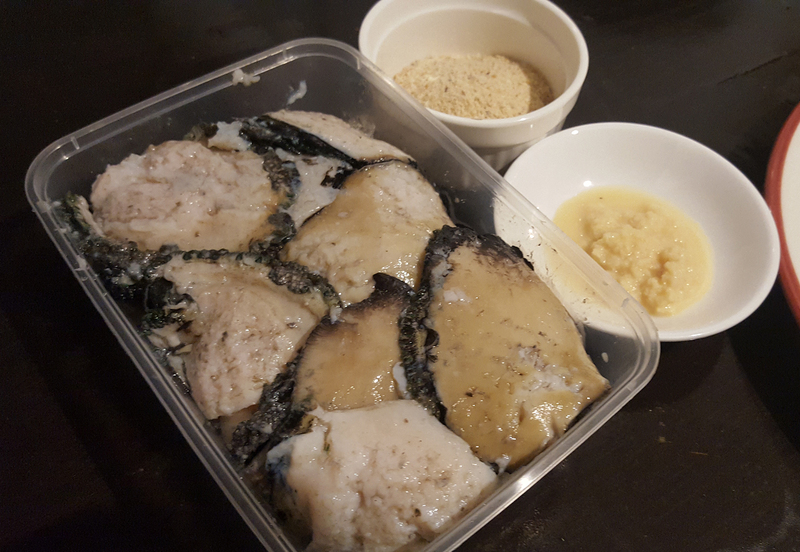 Abalone getting “drowned” (mind the pun) in breadcrumbs and garlic. Step 6. Now is the time to add flavour and texture to the abalone. Dip each side of the abalone in minced garlic (or a combination of minced garlic + ginger), and then drop the abalone in a bowl of breadcrumbs. 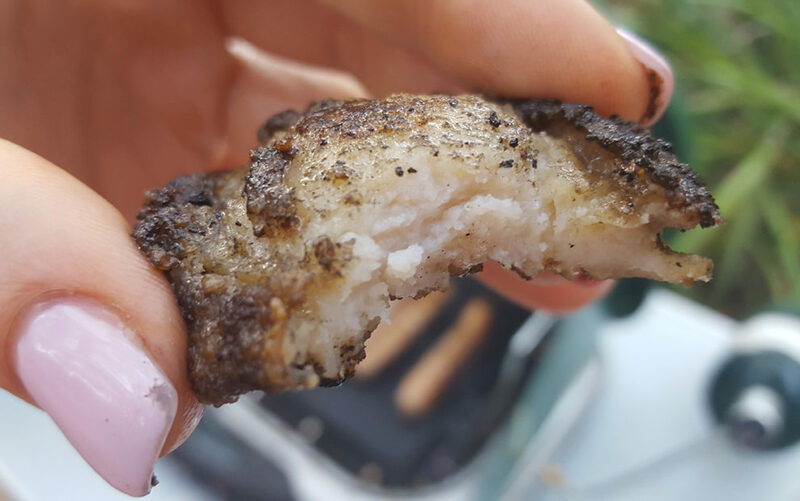 Be generous and really make sure you rub the flavour and breadcrumbs into every inch of abalone meat. For a stronger abalone flavourful experience you can leave the breadcrumbs out or just put them straight on the hotplate with nothing else. 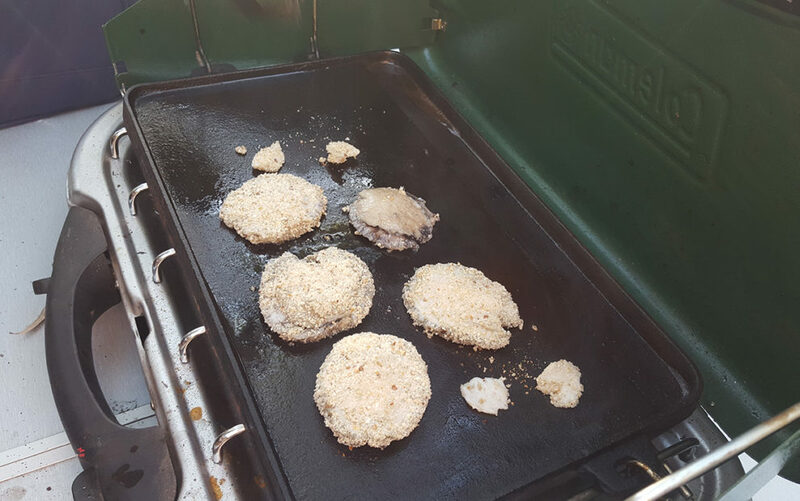 The extra small bites of meat you see on this 2 burner camper gas stove is from taking extra care in cutting out as much abalone meat as possible. Step 7. Now its ready for the BBQ! Just add olive oil which the bread crumbs will soak up. Cook until the abalone is a beautiful brown and golden crispy on both sides. Remember that extra effort when cutting abalone meat before? Well the extra small bites of meat you see on this 2 burner camper gas stove. Saviour every last drop of that precious abalone! 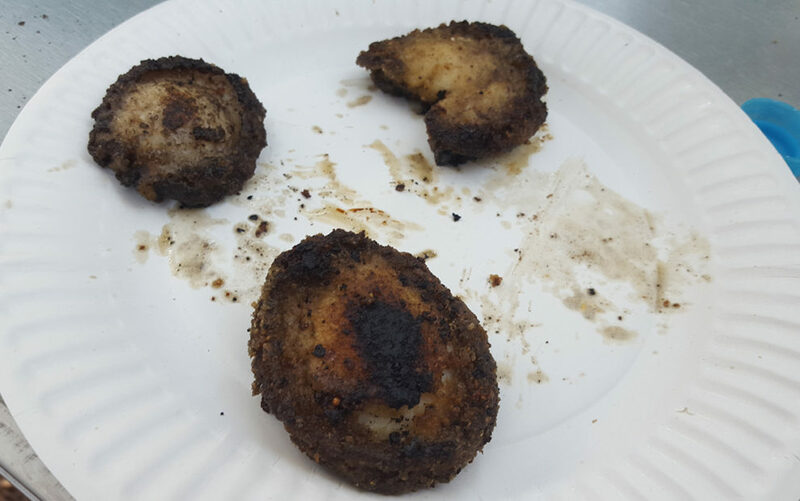 Golden crispy abalone cooked from the BBQ. The texture of abalone is similar to tough squid. Step 8. The flavours of the abalone is brought to life by added herbs, salt and pepper. So make sure to have some on standby. Give a taste test before presenting. 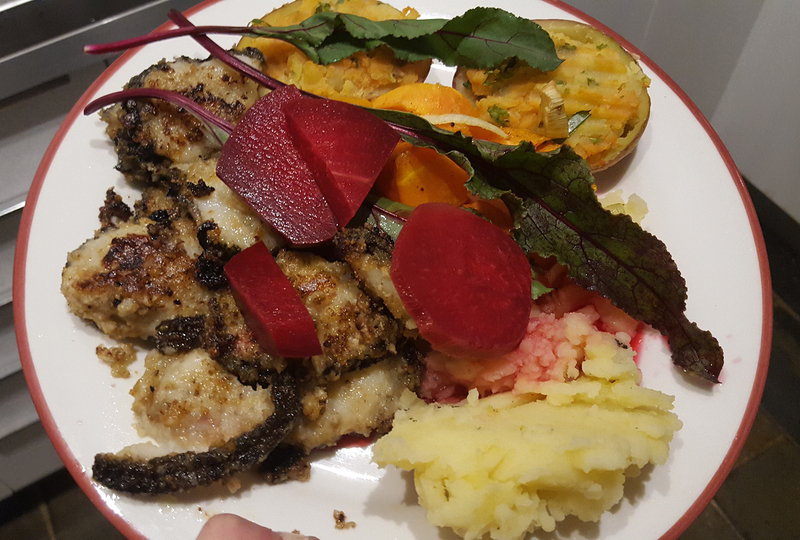 On our plate with the abalone is fresh beetroot, baked potatoes, carrots, onions to name some. Yeh, I eat well. Step 9. Presentation! If you have the extra time and the extra ingredients readily available, have some fresh vegetables on the side to compliment your abalone. A squeeze of lemon over the top is a great way to finish it off too. And how do the abalone taste? You may ask.. The texture is very tough (without the pounding), almost like chewing on a piece of rubber, but not quite. They have a unique flavour, I can’t quite put my finger on it – but it’s like crocodile (where its a combination between fish and chicken). The extra effort of pounding them at the start really helps with softening their texture and makes them all the more a delicacy, plus it makes it easier for added flavour to absorb into their meat. And when it comes to flavour – don’t cut out the garlic, herbs or salt and pepper. They make all the difference. I love garlic and really recommend smothering it on the abalone! Fish Responsibly for the Future! Abalones have been identified as one of the many classes of organism threatened with extinction due mostly to overfishing. 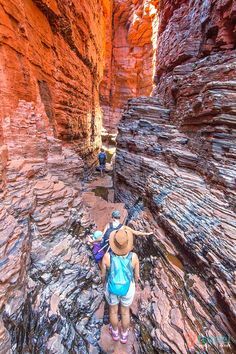 Western Australia is strict with sustainable abalone fishing and often puts notices out when certain areas in the state are off limits. 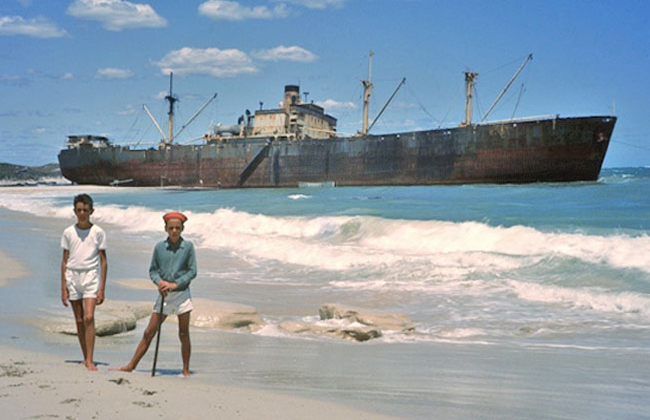 For example, no fishing is allowed north of Moore river until further notice. This is to allow abalone stocks to recover following a high mortality during a marine heatwave off the coast in February and March 2011. It has been predicated that abalones will become extinct in the wild within 200 years at current rates of carbon dioxide production in addition to overfishing. Currently the white, pink, and green abalone are on the federal endangered species list, and possible restoration sites have been proposed for the San Clemente Island and Santa Barbara Island areas. 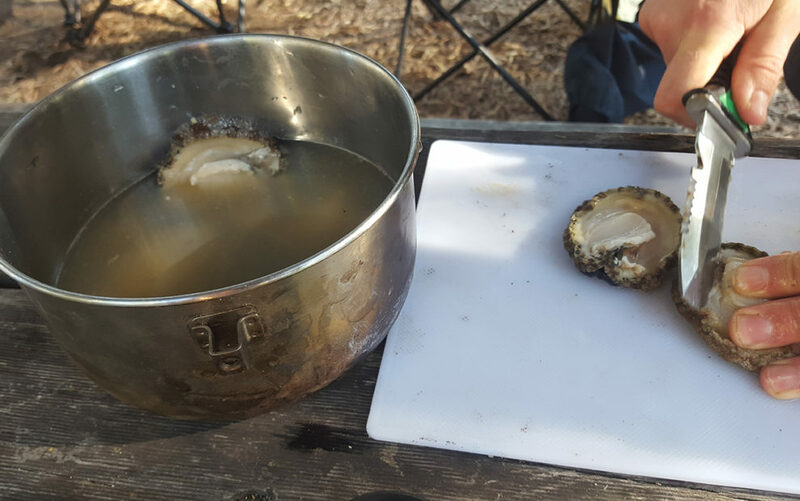 The possibility of farming abalone to be reintroduced into the wild has also been proposed, with these abalone having special tags to help track the population. A license to fish for abalone is strictly required. You can either apply online, download an application form or collect a form from one of their offices. 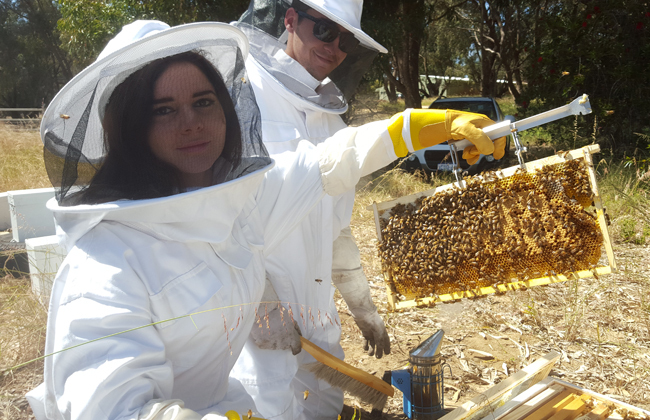 Payment can be made through the online application process, at one of their offices in WA, or by post. 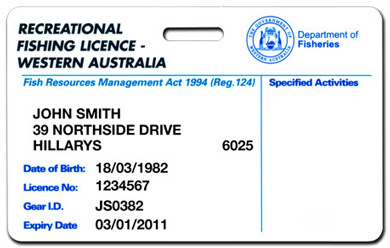 Get started on the Department of Fisheries – Recreational Fishing Licences webpage. Existing license holders will automatically receive a renewal form by post. Also note that you are not entitled to fish until you receive a receipt for your license from the Department of Fisheries. After payment goes through, your license (a plastic card) will be forwarded to you within 14 days of receipt of your fee payment. Information on fishing rules for abalone including size and bag limits can be found online here and in the Recreational Fishing for Abalone Guide. Make sure to visit the Department of Fisheries website regularly for updated information. Thank you to my friend, Chris, for helping me write this article and sharing your insight and tips with me! Do you go fishing for abalone? 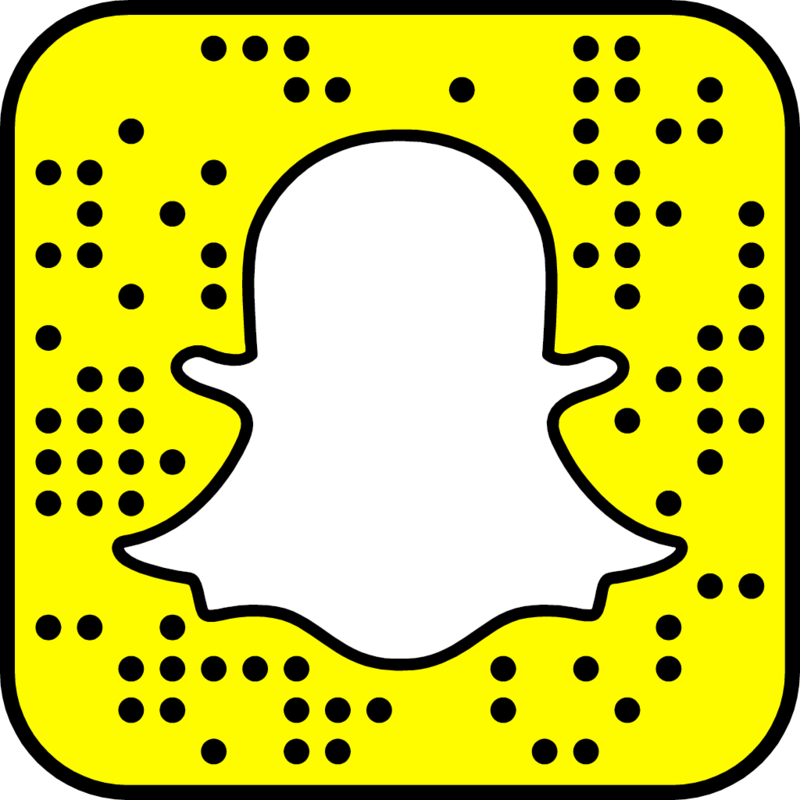 I would love to hear your experiences. Comment below. Thanks for reading!